You want more traffic from Google, right? And the best bit is that you can start using these strategies right now. And don’t forget to download your step-by-step beginners guide to SEO in case you’re new to all of this! In 2015, Google announced their RankBrain algorithm. It’s turned out that Google uses this as the third most important ranking factor and it’s a game changer. Google RankBrain is Google’s first machine learning algorithm. Basically, it measures how you interact with the results on the first page. The happier you make Google’s users, the higher you’ll rank. So while backlinks, keywords, and other traditional signals are still important, RankBrain is definitely on the rise and is one of the top three ranking signals for Google (the other two ranking factors are links and content). So how do you optimise your site for Google RankBrain? Google RankBrain wants to see lots of people clicking on your site in the search results. This tells Google that people love this result and then they’ll boost it to the top of the page so it’s easier to find. But if people don’t click on your site? Google will drop you. Literally. That’s why optimising your site for CTR is so important (more on this later). One of the easiest ways you can get get more clicks is to add numbers to your title and description tag. Luckily that’s exactly what I’m sharing with you in this post, 17 insanely actionable decluttering tips for the new season. Get better at decluttering: click here to download a PDF that shows you how to quickly implement the 17 tips given in this post. Research has proven that people online are more likely to click on content that contains a number. So when you include a number in your content’s title and description, you can increase your CTR really quickly. Google RankBrain wants you to publish a piece of content that makes their users happy. If users leave your site (also known as a “bounce”) after three seconds, that’s a user experience signal that tells Google people don’t like your content. The better your bounce rate, the better you’ll rank. So how do you improve your bounce rate? One way I’ve been working to do this is by writing engaging introductions that encourage people to take action. In other words, I avoid writing meaty introductions that go on forever. If someone lands on a blog post with an introduction that’s four paragraphs long, they’re going to bounce immediately, which is bad for your SEO. Instead, you want to get straight to the point - like the introduction to this post (scroll up to the top if you don’t remember). Anyone landing on this page will know EXACTLY what this piece of content is all about. That copy is super easy to read, right? Plus, it’s even easier to read on a phone or tablet. And considering that most Google searches are now done on mobile devices, readability is more important for SEO now than ever before. I can bet you’ve visited Reddit before. But did you know it’s a keyword research goldmine? Yep, especially when it comes to finding long tail keywords. You go over to Reddit and if you already know a subreddit where your target audience hangs out, head there. For instance, let’s say you wanted to write a blog post about turning vegan. You’d head straight there on Reddit. If you’re not sure where your audience is on Reddit, search for your topic and see which threads and subreddits come up. Then you can scan threads for terms that appear over and over again. If people are talking about those topics on Google then they’re probably searching for those same terms in Google. That means they’re perfect for keyword research. Now we’re moving onto one of my favourite SEO techniques. Let’s say you come across some new research in your industry that would be great in a blog post. But instead of writing a new post about it, why not add it to an existing blog post? You could also update the images and add some new tips to give you a new and improved version of the blog post. That is one surefire way to increase your organic traffic. We all know that pages with more compelling titles and descriptions get more clicks in search results. And the more organic clicks you get, the better your chance of ranking. But how do you know what people want to click on? Simple. Look at the Adwords ads for your keyword. Adwords ads aren’t just simply created. They’re the result of hundreds of split tests done to maximise clicks. You can use copy from these ads to turn your title and descriptions tags into the most clickable things possible. All you need to do is keep your eye out for interesting copy from those ads. Because these words will be proven to generate clicks. So when you include these keywords, you’ll likely get more clicks. Broken link building is scalable and powerful. But finding broken links can be a huge pain. When a Wikipedia editor comes across a dead link, they don’t delete it right away. Instead, they add a footnote next to the link that says “dead link”. This gives other editors a chance to confirm that the link is actually dead before removing it. Which means that it makes finding broken links super simple. Then you would visit a page in the search results that’s relevant to your site. 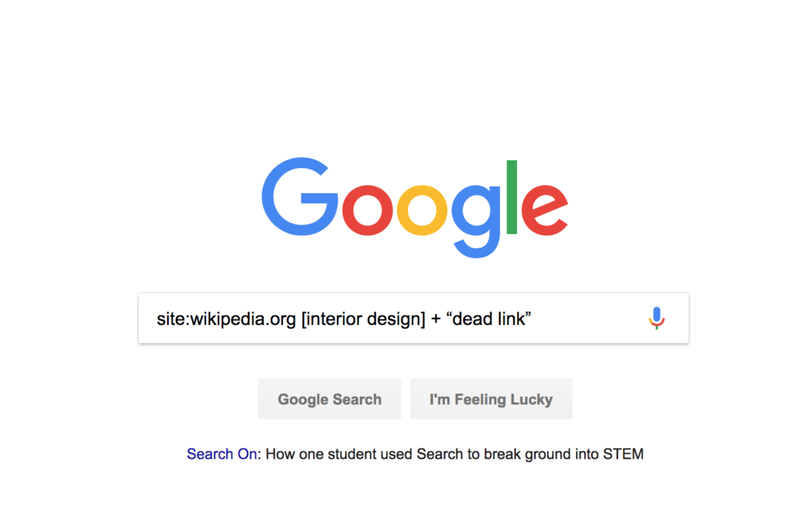 Hit ctrl + f and search for “dead link” - your browser will jump to any dead links in the references section. You can also go to Wikipedia’s full article with all the dead links. So what do you do when you’ve found a broken link? There are lots of things you can do but publishing an ultimate guide or resource page are my two favourites. Now for our next SEO technique. There are basically two main keyword research strategies. Enter random keywords into a tool. Or find the exact keywords that your competitors already rank for. Both approaches work. But the latter can bring you more luck. Your first site is to find a competing site that’s already ranking well in Google. By doing this, you’re reverse engineering sites that already know what they’re doing. In my case, melyssagriffin.com is a website that has a) got content on lots of the same topics I do and b) is going really well in terms of SEO. Next, pop the site’s homepage URL into SEMrush. And you’ll get a list of keywords that they already rank for. Now, many of these keywords might not make sense for your brand. They might be targeting keywords that your readers don’t search for or maybe they’re ranking for really competitive keywords. So focus on the keywords that your target audience searches for in Google AND what you could create amazing content around. Stick with me on amazing content because that’s what our next strategy covers. A lot of content online isn’t worth sharing. But without shares, you’re not going to rank well in Google. Thankfully, getting these shares doesn’t have to be as difficult as you might think. For instance, this post of mine on ideas for Instagram Stories content has done really well. How? It’s generated over 400,000 visits from blogs, social media and search engines. There were a lot of other things that contributed to the success of this blog post, but let me run through a couple of strategies that have worked best for me. First, I shorten the URL of every blog post. For example, the URL for the post you’re reading is: abranchofholly.com/blog/seo-techniques. Short URLs get more clicks. And more clicks = higher rankings. Next, I include social sharing buttons on every page. Notice the floating sidebar on the left-hand side of this page? These icons help to significantly increase the amount of social shares my blog posts get. Now, while Google doesn’t use social signals as a ranking factor directly, it’s no secret that social shares can bring you more traffic. And some of the people that link to you CAN help your rankings. These two steps will optimise your content for social shares and now you want to make sure your page’s on-page SEO is good to go. And that’s exactly what our next batch of SEO techniques are all about. Heard of an important Google algorithm update called Hilltop? 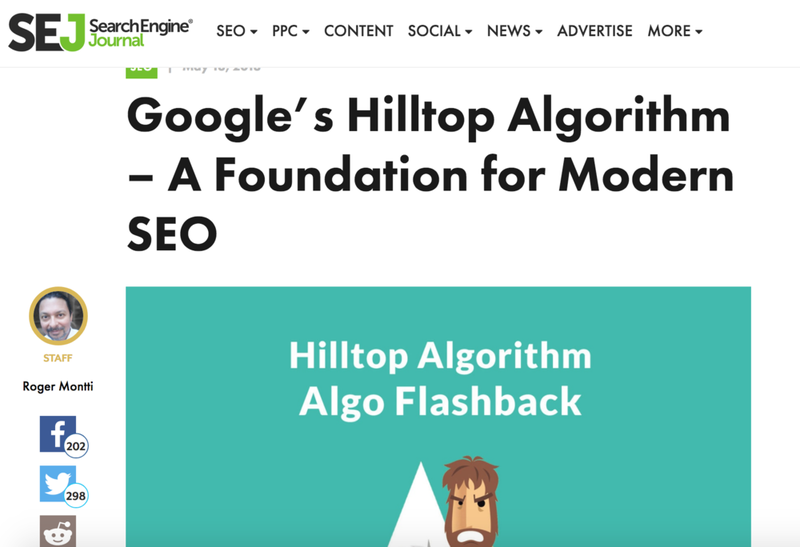 Now, the Hilltop algorithm is old, but it still plays a key part in today’s SEO landscape. Hilltop is an on-page SEO signal that tells Google whether or not a page is a “hub” of information. But the question is, how does Google know which pages are hubs? Basically, hubs are determined by the quality and relevancy of that page’s outbound links. The pages you link out to tend to reflect the topic of your page. And pages that link to helpful resources also tend to be higher-quality. In other words, pages that link out to amazing resources establish themselves as hubs of helpful content in the eyes of Google. Outbound links affect your ranking, PLUS they’re better for user experience too. After all, contextual links help users find content that can help them learn more about the topics you discuss in your article. Link to at least 3 quality, relevant resources in every piece of content that you publish. This will show Google that your page is a hub of useful content. External links are just one of many on-page SEO signals - have a read of this guide I wrote for a more comprehensive list. We all know that if you’re on page 2 or 3 of Google that it basically means nothing. And yes, even if you’re producing high quality content, it can get stuck on the 2nd page if it isn’t optimised well for search engines. So how can you make sure your posts have the best chance of getting onto the first page? It’s simple: throw some internal links their way. Head to Google Search Console >> Performance Report to find keywords where you rank on the 2nd or 3rd page. Hit “Average Position” then sort the results by Position. Then you want to look for keywords with an average position of 11-30. If you’re getting clicks from a keyword on page 2 or 3, you can be pretty sure that keyword has some decent search volume. Identify authoritative pages on your site. The easiest way to do this is by using Google Analytics to find out the most popular content on your website. Head to Behaviour >> Site Content and a list of your pages will come up in order from most popular to least popular. Add internal links from those authoritative pages to the page that needs a boost. Who is this and what do they want? When you’re putting outreach emails together, the faster your answer these questions the better your response rate will be. Use the word “because” as early on as possible in your email. This word has really powerful effects on human psychology. Basically, the word “because” makes any request seem more legitimate. And in the world of outreach, legit emails get better responses. You know all those rubbish guest post pitches that flood your inbox? Can you imagine how well they’d perform if the person actually took the time to make them look legit? This means the person you’re emailing knows exactly why you’re emailing them after two seconds of reading. More importantly, the word “because” makes your email look much more legit. YouTube video results are dominating the first page of Google. And considering that Google owns YouTube, this isn’t likely to change anytime soon. Luckily, there’s a really simple technique you can use to get your YouTube videos to rank for competitive keywords in both YouTube and Google. Write 200+ word video descriptions. Most people just mindlessly throw a few words into the description box when they upload a video or just write a sentence. Google can’t watch or listen to your video content. Instead, they rely on your video’s text-based title and description to determine what your video is about. And this extra text content can help you rank for your target keywords. Remember when Google rolled out the Hummingbird algorithm update? Before Hummingbird, Google only analysed the individual keywords on your page. But this new algorithm, Google can now understand the TOPIC of your page. The ability for search engines to understand topics and rank search results accordingly is called Semantic Search. First you optimise your page around your keyword as you normally would. Then you want to cover subtopics related to your target keyword. This means Google can fully understand the topic of your page, not just your keyword. You can find other subtopics when you search for your regular keyword using Google’s Keyword Planner. If you only include one keyword in your headline, you’re going to be missing out on a lot of search traffic. Just FYI - I don’t mean you should go and start keyword stuffing. Let’s say you pick a keyword for your blog post. But you also find that another keyword gets good results. This means you can get even more traffic by using more than one keyword in your headline, which is better than potentially getting no traffic at all. Find long tail keywords you can include in your headlines - plural. If you want to use keywords that your competitors don’t know about, this is a great SEO technique. Using Keyword Planner for generating new keyword ideas is good, but there’s also Wikipedia - and human minds contribute to Wikipedia. Look at the sections on Wikipedia that display closely related keywords and topics, including: the Contents box, callouts and sidebars, internal links and “See Also” sections. You’ll come away with loads of keyword ideas from a single Wikipedia entry. I’ve used this SO much and it’s one of my favourite SEO techniques ever. The basic rule of link building is that creating a list of high quality niche-specific blogs is like money in the bank. So many bloggers in your niche will be creating these lists for your in the form of “best of” blog posts. These are hand collected lists of the best blogs in a specific industry. The blogs you find you can reach out to next time you want to promote a piece of content or build a long-term relationship. It’s no secret that longer content absolutely CRUSHES 300-word blog posts. And a survey has actually found that the average word count of an article on page one of Google is 1,890 words. Don’t worry, long-form content also performs great on mobile too. The main reason why long blog posts work is because they show Google that you’re providing in-depth information for users. But it also flips an important emotional switch that encourages people to share content: awe. As you can imagine, it’s really hard to trigger awe from a 300-word article...but not from one that’s nearly 2,000 words. This is a big SEO mistake to avoid. Let’s say you have two links pointing to a page on your website and they’re both on the same page. According to the First Link Priority Rule, Google only pays attention to the first link. This is important because if you have a navigation bar at the top of your site, those are the links that Google will see first, even if you then include that link in the first sentence of an article on your site. To combat this, you should aim to use keyword-rich anchor text in your site’s navigation. Because the keyword-rich internal links below them don’t count. You’re always going to rank #1 for any keywords that you create. When you create something truly original, like a brand, product, or step-by-step system, you’re the only person optimising for that term because you made it up. If your creation becomes popular, you’ll find yourself ranking #1 for a high-volume keyword. So the next time you write about a technique that you created (whether it’s a diet tip, productivity hack or system for growing vegetables) - name it. Here’s something you might’ve realised if you’ve been using SEO techniques for a while - a keyword tool is only as good as the keywords you put into it. What I mean by this that if you use the same keywords as your competition, you’re going to see the same keywords they do. Thankfully, you can use seedkeywords.com to beat this. First, go to the above website and create a scenario - this is something that users would use to find your brand online. Then you’ll get a special link which you can send to friends, family and your target audience to see what keywords they would use. This means you’ll get a list of outside-the-box keywords that you can pop into the Keyword Planner. Google is continuing to put more and more weight on the relevancy of links pointing to your site. So if you want to find link building opportunities that are specific to your niche, you need to use flippa.com. Flippa is one of the best places on the web to find untapped link building opportunities. Because people that sell their site on Flippa give away every single detail about how they built their site. Including their keywords, content marketing strategy and link sources. It’s essentially like getting access to their full content marketing plan. Go to Flippa and click on Browse Assets >> Websites >> See All. Go to Website Filters and set monthly users to at least 500 per month. Once you do some digging you’ll be able to find some brilliant link building opportunities. If you’re not using Google Search Console to help with your SEO efforts, you really should be. Because the data you get in this tool comes straight from Google. But just to warn you, there are A LOT of features inside the software that you won’t need. So I’m going to quickly show you how to get more traffic using data you have sitting inside Google Search Console Right now. Login and click on “Search Traffic” and then “Search Analytics” in the sidebar. Then you want to see the keywords that you already rank for or the keywords that give you the most impressions. So make sure you toggle on the Impressions column. Then, see how many clicks you’re getting for these high-impression keywords. If you’re getting lots of impressions for a certain keyword and not many clicks, that means you have A LOT of potential to get traffic for that term. You need to boost your rankings for that keyword. Work on improving your click-through-rate. Users probably aren’t clicking on your results as often as the other sites on the first page. Add more content. Remember, longer content means higher Google rankings. Include multimedia. Try creating content with images and videos. This type of content tends to perform better than an article that’s 100% text. Build links. Backlinks are really important. More high quality links will result in higher rankings. If you’re new to SEO or just want a refresher on how it all works, this free resource is for you - a fast-moving SEO tutorial. It blasts through everything you need to know about search engine optimisation, step-by-step. Enter your details to get access. Which one of these 21 SEO techniques are you going to use first?